344 pages, 8.5" x 11"
From the author of Renaissance Swordsmanship comes the most comprehensive and historically accurate view ever of the lost fighting arts of medieval knights, warriors and men-at-arms. Based on years of extensive training and research in the use of European swords, it contains highly effective fighting techniques for the sword, sword and shield, long-sword, great-sword, pole-arm and more. And with more than 200 illustrations and rare historical documents, it is a scholarly reference as well as a hands-on training guide for martial artists of all levels. 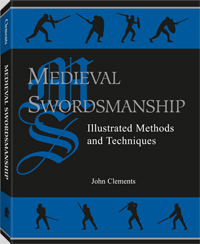 John Clements has practiced cut-and-thrust swordsmanship for almost 20 years and trains regularly in long-sword, sword and shield, sword and buckler, sword and dagger, medieval spear, and rapier and dagger methods. He lectures on historical weaponry and is an ardent promoter of contact-weapon sparring with historical replica swords.